also spelled JHERONIMUS BOS, pseudonym of JEROME VAN AEKEN, also spelled AQUEN, OR AKEN, also called JEROEN ANTHONISZOON, brilliant and original northern European painter of the late Middle Ages whose work reveals an unusual iconography of a complex and individual style. Although at first recognized as a highly imaginative "creator of devils" and a powerful inventor of seeming nonsense full of satirical meaning, Bosch demonstrated insight into the depths of the mind and an ability to depict symbols of life and creation.Bosch was a pessimistic and stern moralist who had neither illusions about the rationality of human nature nor confidence in the kindness of a world that had been corrupted by man's presence in it. His paintings are sermons, addressed often to initiates and consequently difficult to translate. Unable to unlock the mystery of the artist's works, critics at first believed that he must have been affiliated with secret sects. Although the themes of his work were religious, his choice of symbols to represent the temptation and eventual ensnarement of man in earthly evils caused many critics to view Bosch as a practitioner of the occult arts. 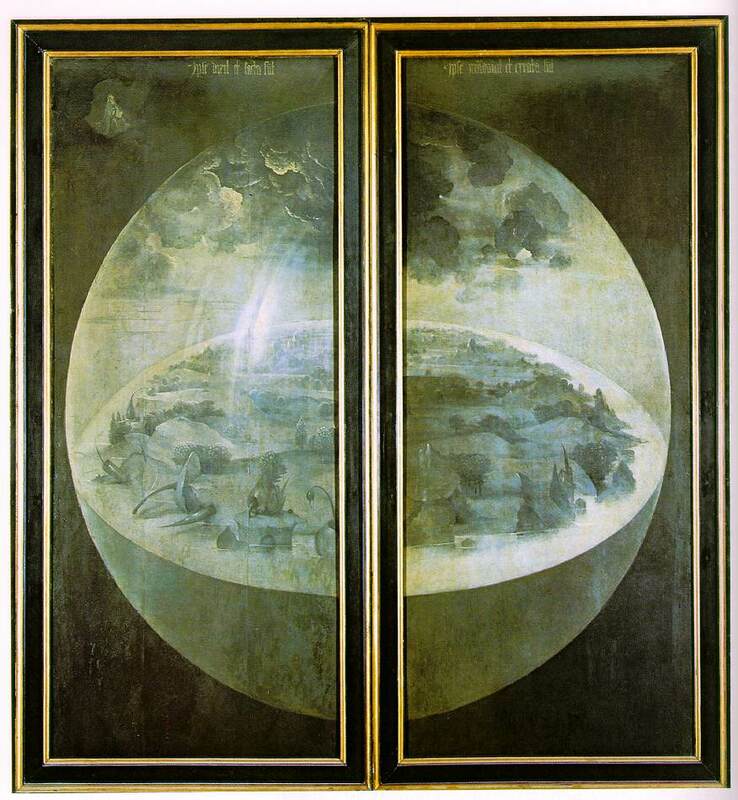 More recent scholarship views Bosch as a talented artist who possessed deep insight into human character and as one of the first artists to represent abstract concepts in his work. A number of exhaustive interpretations of Bosch's work have been put forth in recent years, but there remain many obscure details. National Gallery of Art, Washington Form and Iconography: The use of oil paint to create an incredible level of realism is quite evident in this image. Here, the artist shows off again by showing how well he is able to paint the textures and surfaces but he is also demonstrating his ability to create space.In some ways, this scene is a genre scene. It takes place in what looks to be a domestic setting and the central character is one that the viewer would be expected to identify with. This image seems to be a sarcastic play on the iconography associated with annunciation scenes such as those by Robert Campin's Merode Altarpiecec. 1425. Almost as in Charles Dickens's A Christmas Carol, in this scene, a miser is being visited on his death bed by a variety of fantastic creatures. Death stands ready in the door to fling his last arrow and take the man to his fate while his soul is wrestled over. God is represented by the apparition of the crucifixion in the window. The light that shines through the window is represented similarly to the soul of Jesus being delivered to Mary in the Merode Altarpiece c. 1425. Above the bed, on a canopy, a demon shines a fake sparking lamp to misguide him. Bosch's depiction of a dying miser lying in his high narrow bedchamber features a number of details pointing out the consequences of a life devoted to avarice. The figure of death stands in the doorway indicating that the miser's end is rapidly approaching. And while the miser's guardian angel vainly tries to draw his attention to the crucifix in the window at the upper left, the demonic influence is overpowering.Many commentators have noted that Bosch's work here seems to be of a type which may have been influenced by the Fifteen Century devotional work Ars Moriendi (Craft of Dying) which describes how a dying man is exposed to a series of temptations by demons surrounding his deathbed. At each temptation an angel comforts him and strengthens him and in the end the angel is successful, the soul is carried to heaven and the devil's howl in despair. Here, however, the outcome is much less certain. 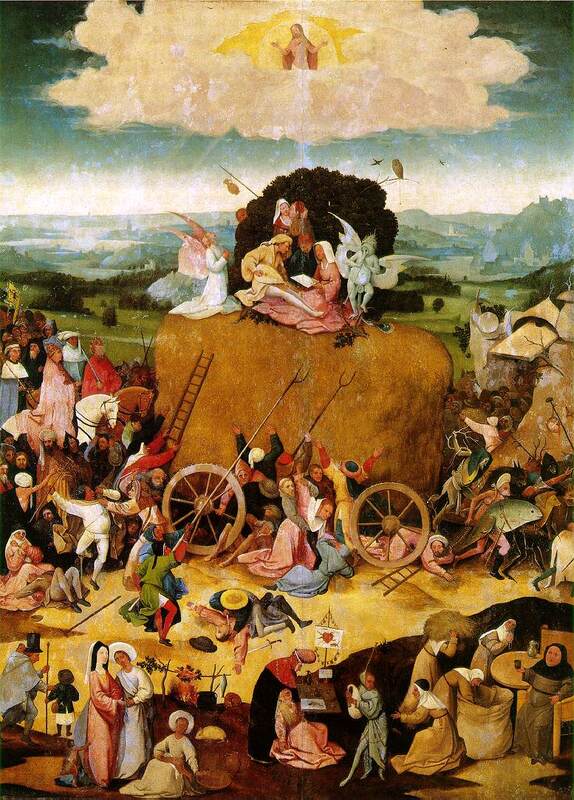 Of all fifteenth-century artists, Hieronymus Bosch is the most mysterious. His puzzling, sometimes bizarre imagery has prompted a number of false assertions that he was, for example, the member of a heretical sect, a sexual libertine, or a forerunner of the surrealists. What can be said is that he was a moralist, profoundly pessimistic about man's inevitable descent into sin and damnation.In this slender panel, probably a wing from a larger altarpiece, a dying man seems torn between salvation and his own avarice. At the foot of the bed a younger man, possibly the miser at an earlier age, hypocritically throws coins into a chest with one hand as he fingers a rosary with the other. In his last hour, with death literally at the door, the miser still hesitates; will he reach for the demon's bag of gold or will he follow the angel's gesture and direct his final thoughts to the crucifix in the window? 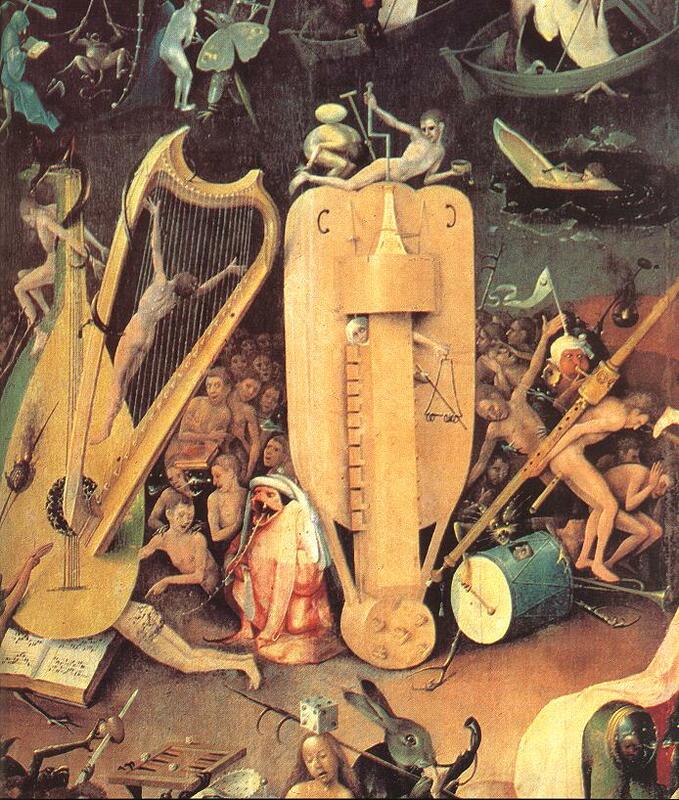 Paradise Context: The subject of sin and its punishments was central to all of Bosch's art. 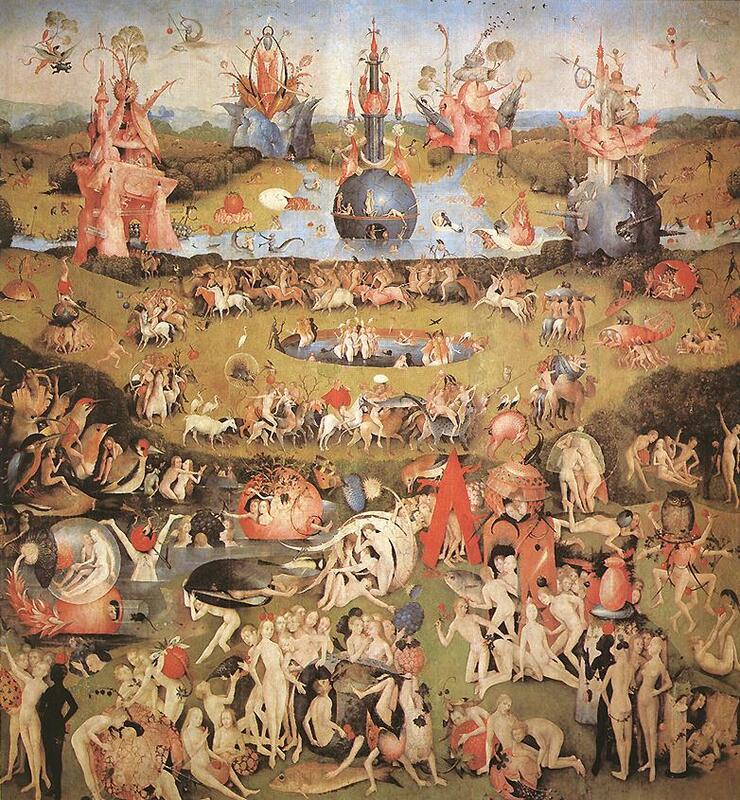 A famous triptych, The Haywain, contains a progression of sin, from Eden to hell, across its panels. In the central panel sin is represented through the metaphor of a large wagonload of hay for which a greedy world grasps. All the while, the wagon is being pulled by demons towards the right panel - which shows one of Bosch's earliest depictions of hell.Form: Interestingly enough, Bosch again is collaging together elements from images by Giotto in his Last Judgement and Masaccio's Expulsion as well as various elements and compositional devices one might find in the Tympanum of Gothic and Rmanesque Churches such as those found at Autun. Oil on panel, Monasterio de San Lorenzo, El Escorial Form: The composition of the center scene is fairly symmetrical. The hay wagon that sits in the center of the image creates the bottom of pyramidal shape that is completed by the figure who sit atop the wagon and God in heaven who looks over the scene.Iconography: The overall scene is one that represents our unavoidable journey to damnation. It is a bit pessimistic. According to Dr. Bruce Lamott, a music historian, the depiction of the individual crucified on the harp, the image of the trumpet shoved up the rear end of one of the figures, and the ears sliced by the knives could be a reference to the ideas that were being debated by the Council of Trent. Many individuals felt that music was too sensuous and the work of the devil and that the new traditions of playing music in Church was a mistake.There are also some very Giottoesque elements in this painting. In the lower right hand of hell is an image of a pig dressed in a nun's habit which obviously is a jab at the greedy nature of the Catholic Church. It is very similar to Giotto's inclusion of the Bishop who is taking money for indulgences and pardoning people in hell. Some college level teaching jobs in the arts.